Background: Intragastric Balloon (IGB) is an alternative endoscopic procedure to achieve weight loss and improve obesity related co-morbidities. The impact of IGB in type 2 diabetes mellitus (T2DM) after its removal is uncertain. Patients and Methods: 28 obese T2DM patients (20 female; mean age 43.5 ± 11.0 years, mean BW107.5 ± 24.5 kg; mean BMI 40.6± 9.3 kg/m2) underwent IGB were evaluated for improvement their glycemic control (fasting blood glucose FBG, HBA1c level, need of hypogycemic agents) after weight reduction in a multi-disciplinary university referral center. Bioenterics Intragastric Balloon (BIB®) system was employed in the study. Remission of their T2DM defined as normalized FBG & HBA1c without need of any hypoglycemic agents. Results: Mean IGB treatment period was 164.5 ± 41.3 days and 2 patients (7.1%) required early removal (27 & 37 days) due to severe vomiting. Mean body-weight, BMI and %EBW loss were 11.3 ± 5.8 kg, 4.2 ± 2.2 kg/m2 and 37.5 ± 34.2 % immediate after removal of IGB. After IGB removal, their FBG (8.9 ± 2.2 vs. 6.8± 3.1 mmol/l ;p=0.0005) and HBA1C level (7.5± 1.5 vs. 6.4 ± 1.8 %;p = 0.011) was significantly improved as compared before IGB placement and 10 of them (35.7%) achieved remission of their T2DM. Nine patients received second stage bariatric surgery (initial T2DM remission, n=3) and further weight loss (weight loss 4.8 ± 10.9 kg) & BMI loss (1.8 ± 4.0 kg.m2) were observed at a median FU of 24 months, and one additional patient has T2DM remission. However, for those patients did not receive additional surgery (initial T2DM remission, n= 7), there were significant weight regain (4.2 ± 5.2 kg) at a median FU of 21.5 months. Their FBG (6.8 ± 3.6 vs. 8.8 ± 2.7 mmol/l ;p = 0.019) and HBA1C level (7.0 ± 2.5 vs. 7.6 ± 1.9 %;p = 0.262) had worsen after IGB removal and only 3 out of 7 (42.8%) of them remain remission from their T2DM. 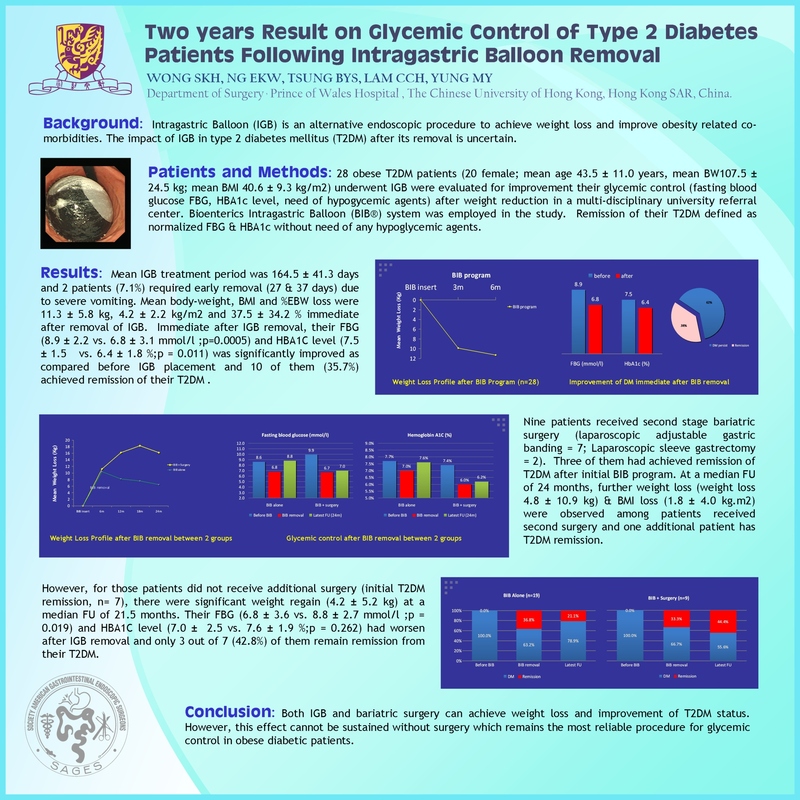 Conclusion: Although IGB can achieve short term weight loss and improvement of T2DM status, this effect cannot sustain and surgery remains the most reliable procedure for glycemic control in obese diabetic patients.